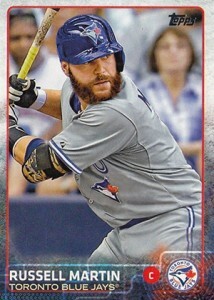 • Toronto Blue Jays catcher Russell Martin (Montreal, Que.) continues to showcase his tremendous throwing abilities. He has now nabbed 31 of 70 runners that have attempted to steal off of him this season. This gives him a major league-best 44 per cent caught-stealing percentage. The 31 runners Martin has caught are the most by a Jays catcher since Darrin Fletcher threw out 32 in 1998 (Fletcher also had 133 stolen base attempts – or 63 more than Martin – against him that season). Alan Ashby holds the club’s record for most runners thrown out in a season. He tossed out 59 runners in the club’s inaugural campaign. Big, burly Charlie O’Brien owns the best single-season caught-stealing percentage by a Jays catcher. In 69 games in 1997, he gunned down 55 per cent (31 of 56) of the runners trying to steal off of him. • On Friday, James Paxton (Ladner, B.C.) made his second start since returning from a finger injury that had sidelined him for close to three months. He held the AL West-leading Texas Rangers to one run in 4-1/3 innings, but didn’t last long enough to record the win in the Seattle Mariners’ 3-1 victory. Earlier in the week, the Mariners adjusted their rotation so that Paxton will get an extra start before the end of the season. “We want to get him out there as much as we possibly can,” manager Lloyd McClendon told the Bellingham Herald. The Mariners hope this increased workload will prepare the Canadian left-hander to pitch more innings in 2016. • Don’t forget to vote for St. Thomas, Ont., native Jack Graney for the National Baseball Hall of Fame’s 2016 Ford C. Frick Award. The Canadian Baseball Hall of Famer is one of more than 20 candidates from the “Broadcasting Dawn Era,” which encompasses those who could be heard on the airwaves during the early days of baseball to the 1950s, on the online ballot. After manning the outfield for parts of 14 seasons with the Cleveland Indians between 1908 and 1922, Graney became the first ex-player to make the transition to the broadcast booth, performing radio play-by-play for the Indians from 1932 to 1953. You can vote here for Graney once every 24 hours. The top three vote-getters from the fan balloting will then be part of a 10-name final ballot (The other seven finalists will be determined by a Hall of Fame research committee). The 2016 winner will ultimately be decided when the Frick Award’s official 19-member committee – which consists of the 15 living former recipients and four historians – votes in November. The winner will be announced at the Baseball Winter Meetings in December. • London, Ont., native Jamie Romak has donated his batting gloves, hat and a shirt from his first game with the Arizona Diamondbacks on August 8 to the Canadian Baseball Hall of Fame in St. Marys, Ont. After batting .284 with 27 home runs and 100 RBI in 129 games with the triple-A Reno Aces this season, the Canadian slugger was called up by the D-Backs. So far, Romak has three hits in 13 at bats for the D-Backs. This is the 29-year-old’s second big league stint; he suited up in 15 games for the Los Angeles Dodgers last season. • When I was reading the backs of some 1932 baseball cards this week, I gained a greater appreciation for an old-time player and manager named Lefty O’Doul. O’Doul was the manager of the first Vancouver Mounties triple-A Pacific Coast League team in 1956, but prior to serving as a minor league manager for over two decades, he was an excellent big league hitter. In fact, O’Doul retired with a .349 batting average in 11 major league seasons between 1919 and 1934. That’s the fourth highest batting average in big league history. So why isn’t he in the Hall of Fame? His critics contend that he didn’t play long enough and that he excelled in the live ball era when offensive numbers were inflated. One of the highlights of O’Doul’s long and storied career came when he was the 59-year-old manager of the Mounties. On September 16, 1956, he inserted himself in a game to bat against the Sacramento Solons. According to O’Doul’s SABR bio, the opposing manager moved his outfielders in and the savvy veteran promptly socked the ball over the centre fielder’s head for a triple. Always enjoy your yogiisms…..I agree with him about the luggage! Hi Len. Thanks for the answer, but it happened even more recently than that. Was it 2010 with Marcum, Romero and Cecil? Thanks, Brent. You are correct! You will notice on Lefty O’Doul’s baseball-reference site that not only did he have a triple while the manager of the Vancouver Mounties in the team’s last game of the 1956 Pacific Coast League season but also he scored a run. After hitting the triple, he scored when his coach, Eddie Taylor, came up next as a pinch hitter and singled. (While Taylor’s baseball-reference site shows his single, it does not show an RBI which I think must be an omission although I suppose O’Doul could have already scored on a passed ball or wild pitch.) Although I saw many games that season (I was 14 at the time), I wasn’t at that particular game but I’m pretty sure I heard it on the radio. And, yes, the outfielders were pulled in, either as a joke or a challenge by Sacramento. An interesting fact about O’Doul’s MLB career. He hit .398 (254 for 638) in 1929 with the Phillies. If he had had one more hit, he would have hit .3996865 which would have rounded up to .400. (He was 6 for 9 in a doubleheader on the last day of the season to raise his average from .394 to .398.) Only 8 players have hit .400 since 1900 and all of them except Shoeless Joe Jackson are in the Hall of Fame and we know why Joe hasn’t been inducted. So maybe the lack of one solitary hit has prevented Lefty from getting to the Hall. Thanks very much for this additional insight on O’Doul, Len. This is fascinating. Let’s hope Russell can hit 2 more HR’s to set career high. So great to see Paxton back. Lots of potential….just has to stay healthy! Please vote for Jack! So great for a Canadian to have a chance to win the Ford Frick award!